This week’s Featured Onepager is tapa the line! 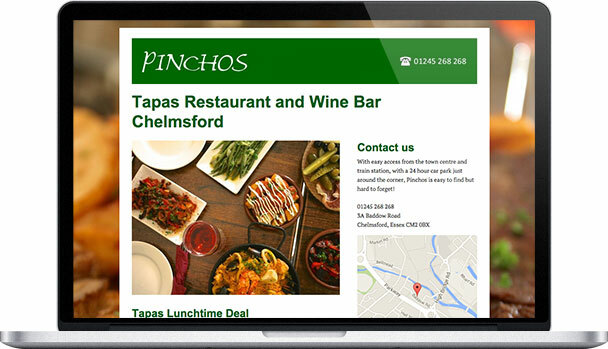 Pinchos is a local tapas restaurant and wine bar located in Essex, England. 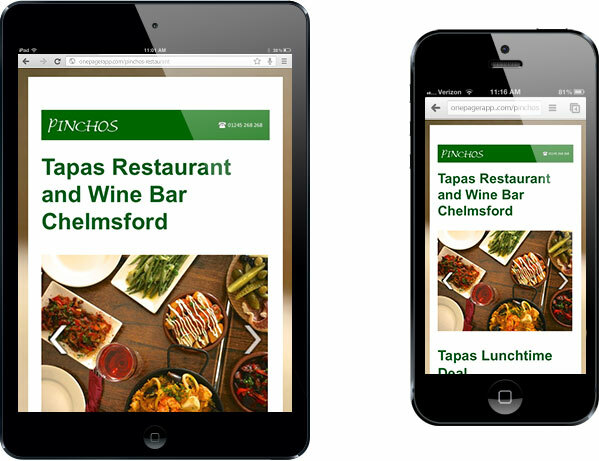 The last few Featured Onepagers we’ve written up have all had particularly wonderful visuals, and Pinchos is continuing the trend this week. We love the slideshow they’ve featured at the top of the page (or “tapa the page” if you’re just as excited about that pun as we are), though we must admit it makes us want to leave immediately and book a flight to England so we can eat Spanish tapas. That wouldn’t be drastic or strange, right? Man, that paella looks good… but we digress! The background photo is another reminder of the delectable deliciousness that awaits you, but by choosing a blurred image, Pinchos keeps the focus on the restaurant information and text while providing an elegant frame that fits the spirit of their restaurant. Pinchos’ page is also really well-balanced between text and images. By featuring photos in both the main area and the right sidebar, they take turns “lifting the weight.” They’re also staggered so that the sit has a nice, natural flow as you scroll down, rather than feeling weighed down at any particular point. In addition to being aesthetically pleasing, the combination of images and headers breaks up the text into digestible chunks, just like how small plates of tapas allow you to move from one dish to the next without getting too full on a single one. However, that’s not to say that you’ll leave Pinchos in any state other than satisfied and full of wonderful Spanish cuisine. Congratulations to Pinchos on being la pata negra!